If you are interested in the posing seminar on March 16th, click here to register. Cost: Free for registered competitors, $10 for non competitors. NEW THIS YEAR: The NWA Pump Off!!! This entry is separate of the NWANC competitor entry. Running format – Prejudging, routine/walk, awards for each category. 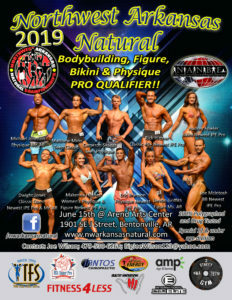 Show starts @12:00; In this order: Men’s Classic Physique, Figure, Female Physique, Male Physique, Bodybuilding, then Bikini. $25 if purchased prior to or on day of 6/13/2019. $30 after 6/13/2019 Back stage trainer pass $10 (one per competitor). For Advanced Ticket Purchase details, click on link at bottom of page. *SPECIAL OFFER* – bring 2 cans of non perishable food items and we’ll take off $5 off of the NWANC late ticket price. If you compete in the NWA Pump Off, we’ll take off an additional $5 of the NWANC late ticket price. Sculptured one-of-a-kind awards, engraved plaques, or swords will be given to the TOP 5 in all divisions, plus overalls and best poser. Imprinted/Embroidered Mr. and Ms. Natural Arkansas jackets given to male/female bb, classic, figure, male/female physique, and bikini classes. 12 and Under competitors earn a t-shirt and medallion if they get on stage (register with parent registration). Winner of each class go to finals where boys winner wins Mr. Little Arkansas battle sword with helmet and girls winner wins crown and Ms. Little Arkansas sash. Judged by crowd on smart phone. NEW THIS YEAR!!! Crowd Favorite where audience (and social media fans) can vote for top winner. Height will apply in novice and open categories. Promoter reserves the right to adjust classes. Comfort Suites Bentonville 2011 Southeast Walton Blvd Bentonville, AR 72712; (479) 254-9099 $79 per night . Please mention NWA Natural Championships before 6/1/2019 for discounted rate and guaranteed booking in the block we reserved. Mixed pairs consist of one male and one female doing bodybuilding poses. 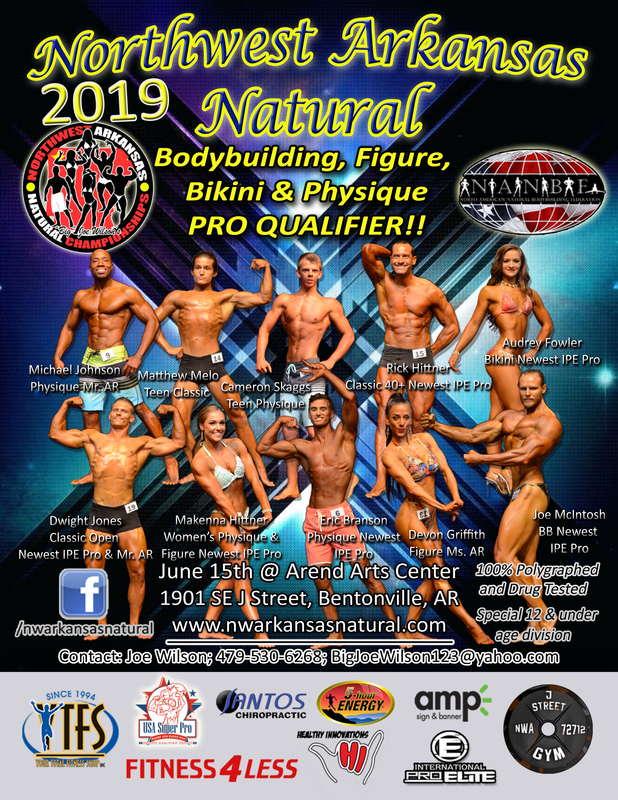 Competitors in this category cannot be from bikini or men’s physique categories – figure, women’s physique/bb, classic physique, or bb are allowed only. Pairs will be judged through a series of poses that will allow the judges to evaluate one physique to the other, the synchronization of movement between the two competitors, and the originality of the routine devised by the competitors. Competitors will pose to music of their choice at final show. If you are entered in more than one class, you will pose only once. Music will be limited to 60 seconds. 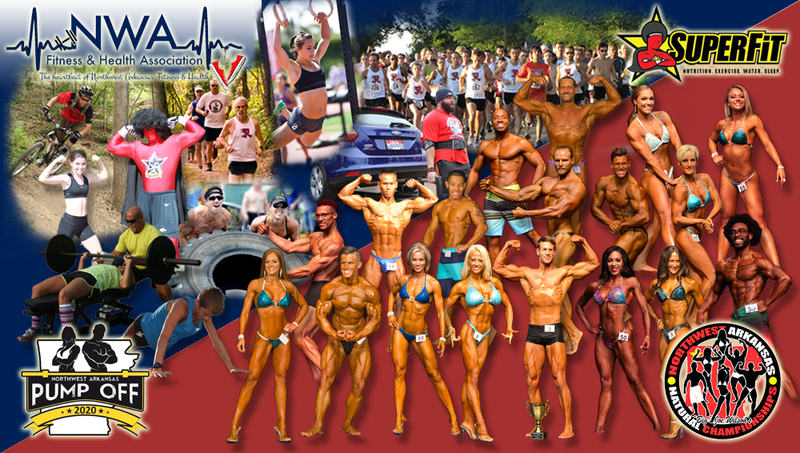 Bodybuilders, Classic Physique, and Women’s Physique/BB will pose to routine for finals only. Music must be cued to start and recording must be of good quality. CD’s only. Two copies must be provided. Figure, men’s physique, and bikini music can be of YOUR OWN!!! – competitors, if you choose to, find the YouTube link of the song and copy/paste it in registration. The entry fee is $75 for the initial division of competition and $60 for each additional division. Entries must be received no later than June 1st, or a late entry penalty of $35 will be applied. Absolutely no entries accepted after June 8th, 2019. (You will receive additional information by email two weeks prior to contest). Recommended entry is online below on this page. 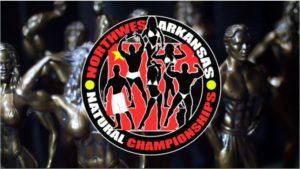 Other options is to download NWANC Entry form paper version and send to address: Joe Wilson Productions, PO Box 1331, Bentonville, AR, 72712. Please make money order or certified check payable to: Joe Wilson Productions. The competition is open to all physique athletes who have not at any time during the 84 months prior to the day preceding this event, engaged in the personal use of anabolic steroids, other growth enhancing drugs, or Rx diuretics used to prepare for this competition or OTC diuretics used seven days prior to event. Refer to the banned substance list at www.NANBF.net or contact promoter for any questions.